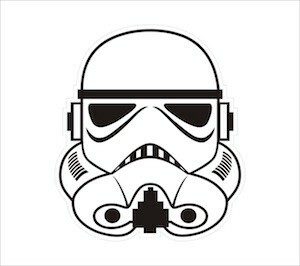 Can Constructionism prevent our children turning into Stormtroopers? London plays host to one of the world’s largest EdTech (Educational Technology) trade shows known as the Bett Show (FKA the British Educational Training and Technology Show) held in association with BESA, the British Educational Suppliers Association. It’s been running in various incarnations and locations in London since 1985 where it was hosted in the exhibition rooms of the Barbican Centre, an arts and conference venue. I remember attending the very first event in 1985 when it was called the “Hi Technology and Computers in Education Exhibition” as a young man at the end of his teens working for a British computer manufacturer called Research Machines Ltd (RML) now known as RM Plc. Along with Acorn (BBC Micro) and Sinclair (ZX Spectrum), RML were the “big” exhibitors and Microsoft hadn’t really found the door marked “entry” beyond a very average BASIC compiler that we had running on our Z80 based 380Z computers. I only mention this bit of history because as I walked around the 2017 edition of the Bett Show I was struck by a sense of déjà vu. In pre-internet 1985 we were also promoting coding, sensors, AI and VR and no, they weren’t steam-powered either. As one of their tech boy wonders I used to run coding sessions for Cobol, Pascal and Modula 2. AI was all the rage in the form of expert systems and some of the pioneering work of Seymour Papert (we’ll come back to him in a bit) and Marvin Minsky. Papert, a few years earlier in 1980 had written and published, what for me was, his seminal book on children, learning and computers; “Mindstorms”, and it changed everything or at least the direction of my career. In 1985, the Apple Macintosh was just a year old and we were talking about “making” in a variety of forms. Yes kids, the future of learning was bright and educational technology would play a central role in its transformation by removing the curriculum, the artificial subject silos and the streaming of kids by age, so that learning could be experienced and lived. A few years later I would attend the second ever TED conference in Monterey where among other people I met Jaron Lanier, the pioneer of Virtual Reality and had the opportunity to try it out for myself. I also met Ted Nelson the pioneer of hyper-linking and Alan Kay who had conceptualised the idea of mobile computing, an idea that I later plagerised to build a mobile computer for kids in the early 90’s called “Satchel”. Papert, who I had the opportunity to spend time with in those years, had developed a learning theory he called “Constructionism”. Papert had been a student of Piaget and Vygotsky who had developed philosophies about the nature of knowledge called Constructivism and Social Constructivism respectively. Constructivism is primarily focused on how humans make meaning in relation to the interaction between their experiences and their ideas. That is, their learning is as a result of their experiences. Such experiential learning, rather than the abstract learning of content by rote, inspired Papert to develop his own Constructionist learning theory. Papert saw how, at the dawn of the micro-computer, learning could be a reconstruction of knowledge rather than simply a transmission. That learning could be personal, experiential and situated where, aided by digital systems, learners would effectively construct their own meaning as a discovery of knowledge. This, Papert believed, was the true liberating power that computers would bring to future learners and teachers as creators of learning experiences. But this is where the similarity between 1985 and 2017 ends. The optimism that we shared for the future of learning dwindled as technology was co-opted not to liberate but to reinforce standardisation and automation of schools ways. As I walked around the 2017 Bett Show I was struck by how exceptionally bland everything was, bathed in fluorescent lighting that felt like it was irradiating the soul out of the machines like it was E.coli. 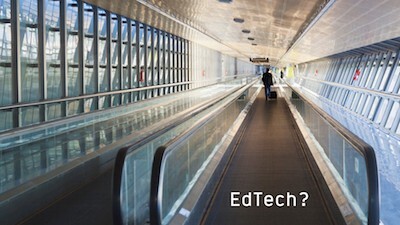 Despite the incredible financial bets being made on EdTech, with more money than ever being injected into start-ups, they’ve turned EdTech into the equivalent of airport passenger conveyors or “satellite navigation” for learning which means you never get lost and you always end up at the same destination passing through the town of Boredom. Enslaved to the tyranny of testing and measurement, the affordances of todays technology in EdTech form are being used to develop ever more efficient ways of delivering a 19th century curriculum. Perhaps we have lost sight of what education is for and why we send our kids to school? Essentially we are using today’s digital platforms to go into reverse. We’re talking about content, and teacher at the front distribution while measuring the effectiveness of our tech by improvement in measured learning outcomes for which read, passing tests. When you look at who’s making the big financial investments in EdTech things suddenly become clear. There is a chain of command of organisations, think tanks, agencies and deliverologists who brief financial institutions that whatever bells and whistles you’ve got the point is to get school kids through a set of tests preferably owned by another multinational corporation like, for example, Pearson. This, while the creeping privatisation of state education via academisation, charter and free schools who are adopting similar leadership strategies to those used in retail or fast food outlet management to the shop floor. Sorry, I mean classroom. These strategies are based around standardisation and automation of content distribution and testing. By focusing on instruction rather than the learner, actual personalisation can take a backseat. But what about “personalised learning” I hear you cry? Well, it takes a human being, practiced in the craft of teaching, to do that. Personalised learning is focused on the child rather than the instruction and the individuated or differentiated learning that software is capable of, think Amazon recommendations for example, is all about instruction. This is what is known as “Instructionism” or the explicit teaching 0f facts or showing students how to solve problems and then having the students practice them. Instructionists believe that learning is the direct result of having been taught. Turning our kids into Stormtroopers when they could be Jedi? Amidst the big budget trade stands/booths at the outer fringes of the galaxy are new start-ups, many of which are existing on the financial equivalent of fumes. This, to me, was where the action and excitement was. New EdTech designers like Night Zookeeper, Erase All Kittens, SAM Labs, Pi-Top, Stepping Into Business, Detective Dot, A Tale Unfolds, Technology Will Save Us and many others have embraced, wittingly or unwittingly, the spirit of Papert’s Constructionism. These young organisations are all about providing the tools and the opportunities for experiential learning that is centred on the learner rather than the instruction. I would argue that it is organisations like these who, rather than those seeking to automate and standardise education, are like a “Rebel Alliance” liberating learners and teachers alike to create their own, powerful learning experiences. Learning how to learn, solving abstract challenges and creating new knowledge must surely be some of the most vital competences that a child can leave school with. It’s hard to see how another interactive white board or learning management system, with or without AI, will provide access to these skills. Yet these nascent enterprises give me hope that EdTech has yet to have its soul completely crushed, swallowed and spat out as another uberfication of education where the learner is simply a passenger and the destination is a set of certificates from a bygone age. Perhaps we need an alternative event to the kind that the Bett Show, or ISTE for that matter, has become. Perhaps we actually do need to form an “EdTech Rebel Alliance” where all of the stakeholders of learning, that includes teachers, parents and learners can converge to design new learning futures. It strikes me that we need something that isn’t just another EdTech incubator/accelerator/trade association Ponzi scheme where whoever pays the most cash gets the most attention. I’m thinking of a mutually supportive collective committed to radically transforming education not by automating it but by liberating it from the tyrannical business plan of a multinational corporation. EdTech Rebels of the World, Unite! You have nothing to lose but your chains! Since posting this article I have received a huge number of enquiries from individuals and organisations who are keen to help me establish and be part of an “EdTech Rebel Alliance”. I hadn’t anticipated this level of enthusiasm and so I am now considering how best to respond to this interest and to create something of value to those interested in being a part of it. In the meantime I have set up an ERA mailing list that, if you’re interested in keeping updated, I invite you to join. Many thanks and may the Force be with you! Unless specifically stated, opinions and points of view shared are my own. What does AI mean for Education?